An Animal Intelligence reader (I’m sorry, I don’t remember whom) alerted me to a recent article in The New York Times about recent research into the brains of chimpanzees. The article also elaborates on the work Iowa State primatologist Jill Pruetz. She’s the researcher who recently “described 22 examples of chimps in Senegal making stick spears to hunt smaller primates for their meat”. The article provides some more information about the video I posted last month. Some of the research on chimps takes them outside their natural habitats and places them in completely foreign situations. How they respond here points at just how intelligent the animals are. 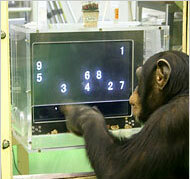 Chimps on their own would not sit at a computer responding with rapid touches on the screen as a test of their immediate memory. Videos of their doing just that at Kyoto University in Japan especially impressed the symposium scientists. This is the best article on animal intelligence I’ve found in eight months running this blog. I recommend it highly. It’s fascinating. It describes how chimps in Gombe, Tanzania have developed different tools from chimps in Bossou, Guinea. It describes how the chimps exhibit sentience and altruism, traits often cited as being human-specific.